All of us, at least many of want to be time efficient. But we all know what happens: we bow to the notification popping up on the screen. How can we resist? In our social-media-scepticism we don't argue for complete withdrawal from the world. However, we also think that oversharing is often harmful to the people doing it. This is well illustrated with the example of a mall: you enter for one thing and buy 20 others. But we don't need that stuff, we don't want to spend that much time! This train of thought led us to the conceptualization of Scrutily: giving people the possibility to easily judge the quality of the content which they consume at a daily basis. 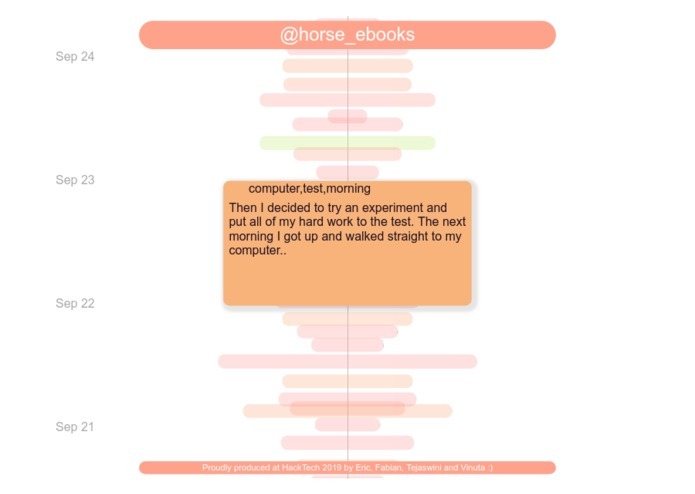 Scrutily rates content-quality of tweets and displays the results graphically in a web app. Searching with an @ handle gives access to the last 100 tweets of the respective Twitter user, e.g. @ElonMusk. Searching with the # tag gives access to the last 100 tweets using the respective hashtag. The displayed information is color-coded in terms of its quality. Green is equal to high-quality content, orange means average and red symbolizes low-quality content. 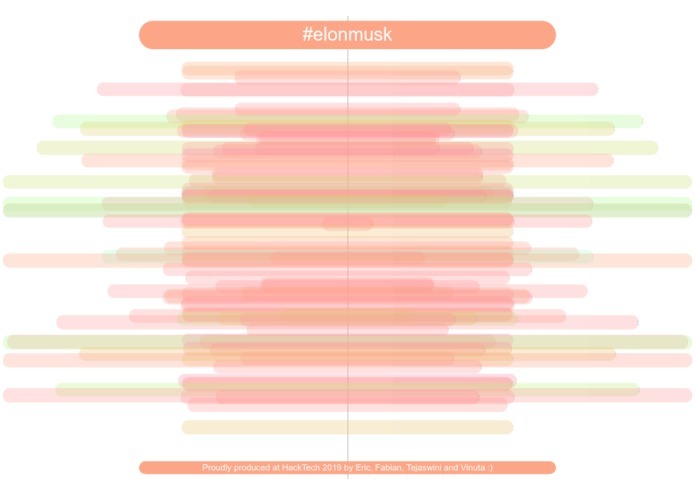 Additionally, the information is length-coded; the longer the tweet, the longer the bar. We started with an open brainstorming session about machine learning, educational tools, and a critical stance towards social networks. From the start we were passionate about user-friendly graphical representation of data. In close teamwork in our interdisciplinary team, we collaborated heavily to facilitate a strong integration between backend- and frontend-mechanisms of Scrutily. We are especially proud of our innovative app concept which bridges awareness-raising, art, and education with a fun and easy-to-use rating feature. Our key take-aways: -> Designing things is demanding, and can be very fulfilling. -> Conceptualizing and applying natural-language-processing in a socially conscious application was an intriguing task. -> Communication and collaboration of ideas and brains is important and when done well (like we did ;)) a lot of fun!